I drew this hobbit girl for my mom a few years ago, I think for her birthday. My mom is a huge Lord of the Rings fan, and we both pretty much agree, if we were in that world we would make excellent hobbits. (Second breakfast? Yes please) So here’s a little hobbit girl with four outfits. Wikipedia says that “uncritical acceptance of the Annals of Ulster would imply that he [St. Patrick] lived from 373 to 493″ and for the purpose of paperdolling, I can be uncritical. 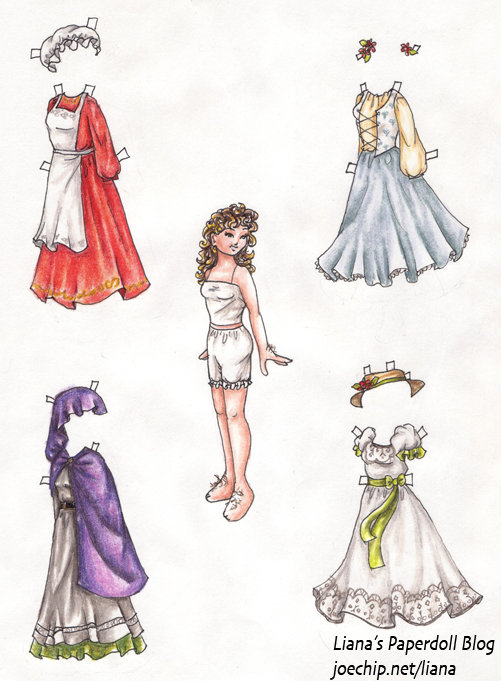 This is my guess at what an upper-class Celtic woman might have worn during the time of St. Patrick. She wears a sleeveless saffron-dyed, heavily embroidered léine, which is a linen tunic, over another light green sleeved léine. At this point, the sleeves, if there were any, were long and straight; the larger sleeves that you might see at a Renaissance fair come later. 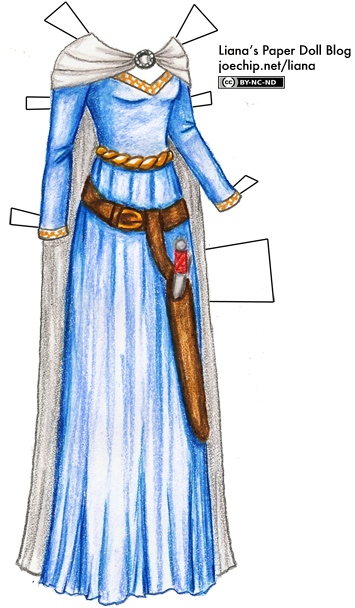 The green fabric she wears as a cloak is called a brat, and it’s made of wool and edged with gold. She pins the brat with a white bronze penannular brooch, and she wears a woven leather belt. Also, if you’re looking at the dress and thinking “Well, how would someone actually cut that out? Or were hand amputations common in the 5th century?” my advice would be to cut a line between the edge of the sleeve and the cloak and slip her hand through it. This is, of course, if you have already followed my advice (given somewhere…) to cut Sylvia’s hand away from her hip, so that dresses like Margaret Hale’s gown work better. Brian told me I should have done something for Saint Urho. Maybe next year.